(FORT BEND) – National Make a Difference Day was on Saturday, October 28, but for the students and staff at Texas State Technical College in Fort Bend County the project continues beyond one day. 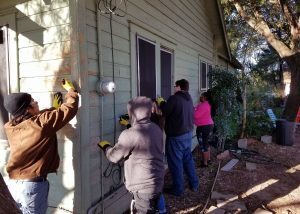 TSTC has partnered with Fort Bend Community Revitalization Projects (CORPS), a nonprofit corporation that has completed repairs on more than 3,500 homes in Fort Bend County, and its Hearts and Hammers program, which focuses on the exterior restoration of homes. The students were set to paint a 55-year-old home belonging to an elderly woman during Make a Difference Day, but because the house required additional work and the yard needed care, painting was postponed for November 4. Instead, the students mowed and manicured the lawn, cleaned debris that was left over from the flooding caused by Hurricane Harvey, power washed the home and removed old paint. For Electrical Lineworker Technology student Madison Ellis this was his first National Make a Difference Day, but as a long-time volunteer for the Special Olympics he is no stranger to community service. This is why it was important to Ellis and his peers to put in the extra elbow grease. Calzada said she is excited for their second Saturday on the project and expects additional TSTC students and staff to join them. This is the second year TSTC’s Fort Bend County campus participates in National Make a Difference Day. TSTC Executive Director of Student Life Adele Clinton said statewide, among TSTC’s 10 campuses, the number of student volunteers for this day has increased exponentially with close to 400 students putting in at least 1,500 volunteer hours. For more information on TSTC and the programs it offers, visit tstc.edu. This entry was posted in Fort Bend County on November 7, 2017 by Amanda Sotelo Sotelo.